VdB 26 is a small reflection nebula in the constellation Taurus. 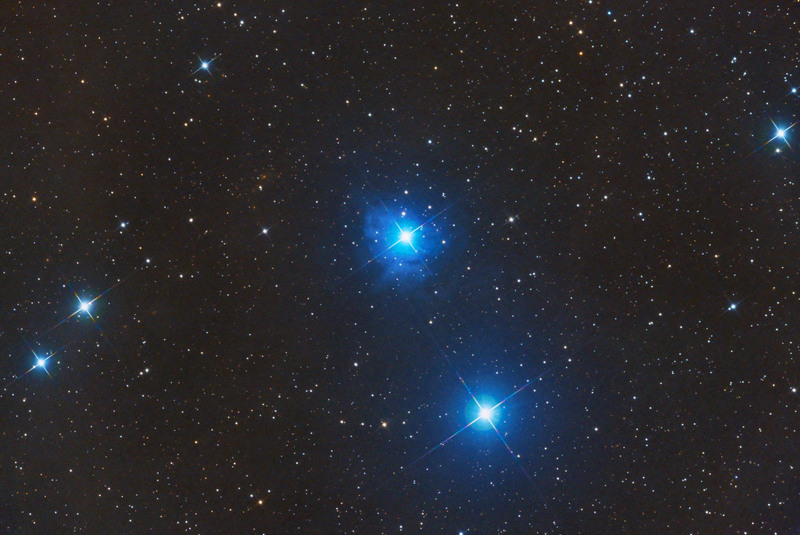 The star illuminating the nebula is cataloged as HD 26676 and is a blue-white main sequence star of magnitude 6.24. The cloud receives radiation from this star, getting thus its blue tinge. Given the distance of 502 light years, the star and nebula have to be on the outer edge of the Eridanus Bubble. According to some theories, the extended size of this bubble, which reaches the borders of the Orion Molecular Complex, combined with the presence of hot plasma observed in the external sector of the bubble itself, would be a clue that suggests the supernova explosion in the last million years in an intermediate position between the solar system and the Orion region. The pale yellow dots resembling an open star cluster (on the left and up from VdB 26) are actually the cluster of galaxies Abell 478.